Since 2011, California’s water supply has lost 4 trillion gallons per year and the Sierra Nevada snowpack has hit record lows. California’s Lake Oroville reservoir was at 30% capacity in September, approaching the 26% record low of 1977. New data from NASA say that California needs 10 Lake Oroville’s worth of water to recover from the current drought. Photo from California Department of Water Resources. Images of docks stranded above lake shorelines and of desiccated earth cracking and turning into dust have become commonplace after three years of crippling drought in California. Now we have a new perspective on the severity of the water shortage: a view from space. 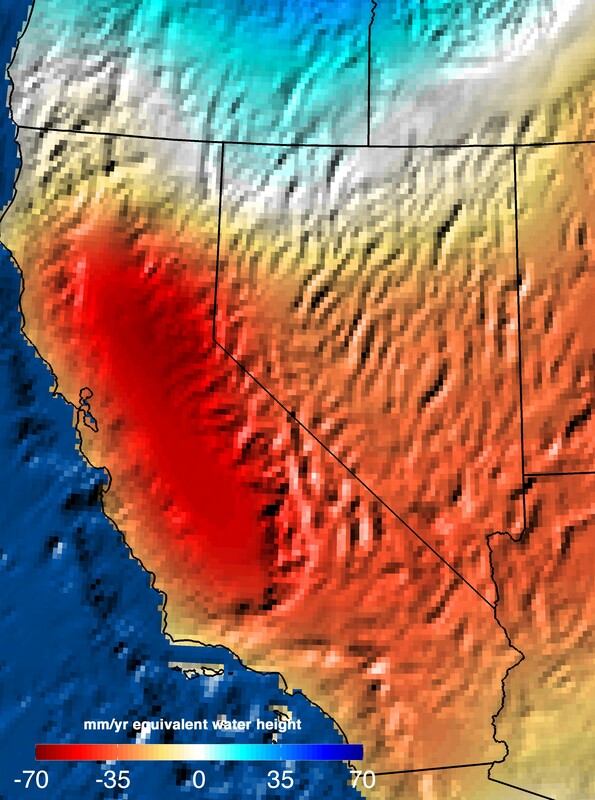 A new analysis of satellite data reveals that California needs 11 trillion gallons of water (42 cubic kilometers) to get out of its ongoing drought, NASA scientists reported in a press conference at the AGU Fall Meeting on Tuesday. California’s Lake Oroville in 2011. Photo from California Department of Water Resources. Since their launch in 2002, the twin satellites of NASA’s Gravity Recovery and Climate Experiment (GRACE) mission have acted like a space-based water meter, measuring month-to-month changes in the volume of water in California by detecting subtle variations in Earth’s gravity. These data have allowed NASA scientists to calculate, for the first time, exactly how far California’s water supply has fallen behind its seasonal norms. The data show that two-thirds of the 11-trillion-gallon loss represents groundwater depletion in California’s Central Valley. The loss reflects unsustainable use of water resources by state policymakers, Famiglietti said. Another major contributor to California’s water shortage is the declining snowpack in California’s Sierra Nevada range. This problem is twice as severe as previously thought, according to new data from NASA’s Airborne Snow Observatory (ASO), also presented at the AGU press conference. Thomas Painter of JPL, who leads the ASO project, explained that early data from the airplane-based science lab revealed that 2014 snow levels had reached a near-record low, the lowest since 1977. Now California’s population is twice as large, putting significantly more strain on the state’s limited water, Painter said. The trend may be hard to recover from, Painter said, because the loss of snow exposes darker mountain terrain, which absorbs more heat from the Sun and makes it harder for future snows to stick. This means that even if winter storms return in force this year or the next, California will be in trouble if the clouds drop their moisture as rain rather than snow, which Painter said is increasingly likely as the climate warms. Much of the runoff will simply flow down to the sea and be lost. “We’ve seen some of that, but nothing like where we’re going with warming,” he said. The NASA scientists expressed hope that the new detailed data about available water resources from their space-based and airborne observatories will aid policymakers who need to make hard decisions about how to allocate water for current and future droughts. NASA leadership has extended the original 5-year GRACE mission and plans to launch a new pair of satellites with enhanced technology in 2017, said Matt Rodell, chief of the Hydrological Sciences Laboratory at NASA’s Goddard Space Flight Center. However, “We don’t know if GRACE is going to last that long,” Rodell told Eos. He explained that several of the satellites’ solar-charged batteries have already failed, forcing the team to power the sensors down whenever the satellites fly through Earth’s shadow to save power. “We’re trying to keep it going as long as possible,” he said. Citation: Weiler, N. (2014), Satellites show true extent of California drought, Eos, 95, doi:10.1029/2014EO020819.